A last-minute snag is preventing the long-awaited return to Ethiopia of an 1,700-year-old stone obelisk. The 160-ton monument was looted from the ancient city of Axum by Italy's fascist dictator, Benito Mussolini, seven decades ago. After finally agreeing to its return two years ago, the Italian authorities have not been able to find a plane to airlift the heavy sections of the monument back to Africa. Italy, the country with the world's highest density of art treasures, wants to show it's giving a good example to the rest of the world in returning stolen art. It hopes that some of the countless art work stolen from Italy and now in foreign museums and collections might one day also be returned. 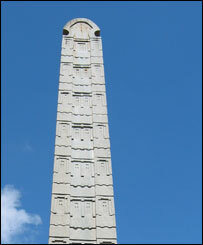 The Ethiopian government has been asking Italy for years to return the 24m-high (79ft) stone obelisk. It is regarded in Addis Ababa as an important part of the country's cultural heritage. Finally, Prime Minister Silvio Berlusconi agreed two years ago that the monument could be dismantled and transported back to Africa. It has cost the Italian government millions of dollars to divide the obelisk into three sections and pack it safely for transport. But only the Americans and the Russians have cargo planes powerful enough to airlift the monument. When it was brought to Italy as war loot back in 1937, the Ethiopian obelisk travelled by sea just like all the ancient obelisks which were transported to Rome in the days of the Caesars. But Ethiopia no longer has access to the sea, after the secession of Eritrea from the country which in fascist times was called Abyssinia. There have been other last minute delays. Two years ago, a bolt of lightning struck the Axum monument and destroyed part of the top of the obelisk. 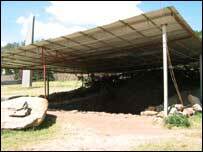 It has now been repaired, and a spokesman at the Ethiopian embassy in Rome told the BBC that the monument is in a warehouse near Rome's Fiumicino airport, awaiting a solution to the latest snag in transporting it back to Africa.